A new wellbeing pack will help those being introduced to the Living Well Network Hub (LWN Hub, the front door to mental health services in north Lambeth) to get the best out of their journey to recovery and quality of life. “The idea of the wellbeing pack came from an Assessment, Action and Planning (AAP) session last year, ” says Emma Willing, Programme Manager of the Provider Alliance Group (PAG), which is part of the Lambeth Collaborative. “These sessions are where staff, users and carers explore ideas and change to support a new way of working. 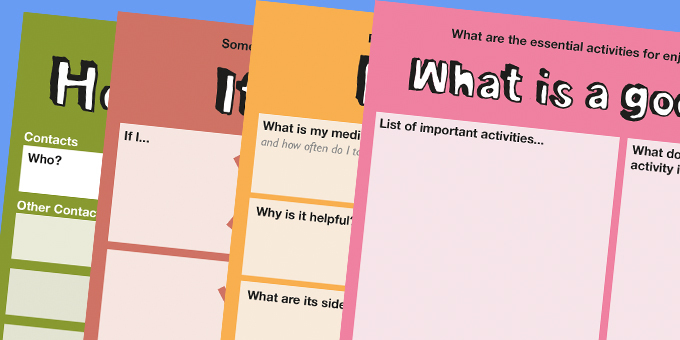 Since that time the packs have been coproduced with peers, clinicians and service users whose comments and feedback have helped us to develop them. “People being introduced to the LWN Hub will be given a wellbeing pack on their first visit,” explains Emma. “The cards will form the basis of initial conversations of what is happening in the person’s life, where they want to go to, any obstacles in the way and how to get support in the future. To find out more about the Living Well Network visit the Open Event, held on the last Thursday of the month, 11am-12.30pm at the Living Well Partnership, 65 Effra Road, Brixton, SW2 1BZ. For more info contact info@mosaic-clubhouse.org.